Is there anything more enjoyable than the aroma of freshly ground coffee. Many of us miss out on fresh coffee because we choose convenience over quality and as a result this generation has relegated their taste buds to accept coffee from coffee pods and K-cups. Even those of us that use the latter product can't help but recognize its inferior quality. Coffee boasts health benefits that are quickly lost in the process of productions and shelf life. Coffee not only loses its freshness, it also loses antioxidants when exposed to air. Grinding your beans at the grocery store isn't really optimal unless you intend on making your coffee soon after the process. The solution, and one I can't stress enough, is investing in a good coffee grinder. Cuisinart carries some really nice highly rated grinders. I use the Grind Central Coffee Grinder. It's ridiculously easy to use and rivals more expensive units. Every morning I make four cups of coffee. The grinding bowl is marked at four, ten and twelve; the tippy top renders eighteen cups. I love that the bowl is marked, it makes the process so much easier, especially if you're a newbie. My next step after adding the fresh coffee beans into the grinding bowl was to put on the lid for the Grind Central and press the button, located on the top of the lid (see photo below). I control the grind by the duration that I'm pressing the button. It really is so simple, and may I add, mess free. 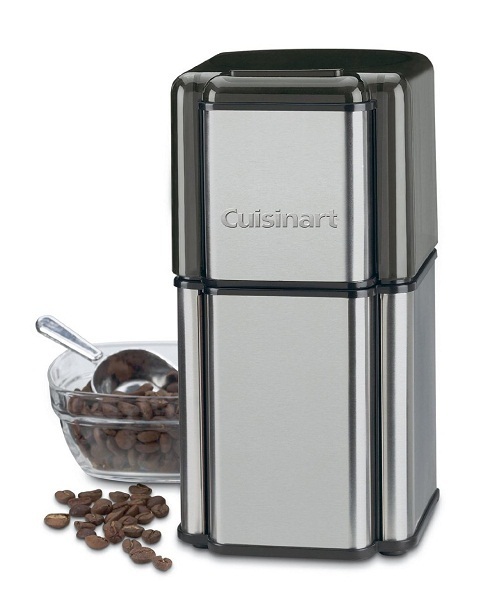 Cuisinart gives you recommendations to accomplish a desired grind for your preferred method. Since I use a French Press, I normally hold the button for ten seconds for a coarser grind; although twenty seconds is advised, I find ten seconds to be sufficient. The above photo shows coffee ground for thirty seconds. Cuisinart recommends this duration to accomplish a medium-fine grind, which is ideal for a drip coffee maker. If you're a complete novice like myself, you will find Cuisinart's suggestions to be really helpful. Incorporating freshly ground coffee into your morning routine requires very little effort and time. It's a matter of getting started. Once you've added this to your daily routine you'll find it becomes second nature. Just think, every morning your senses will be delighted with the experience of enjoying a wonderfully pleasant cup of coffee. Now that you've joined the ranks of the coffee elite, it's time to sit back and enjoy your freshly brewed coffee. 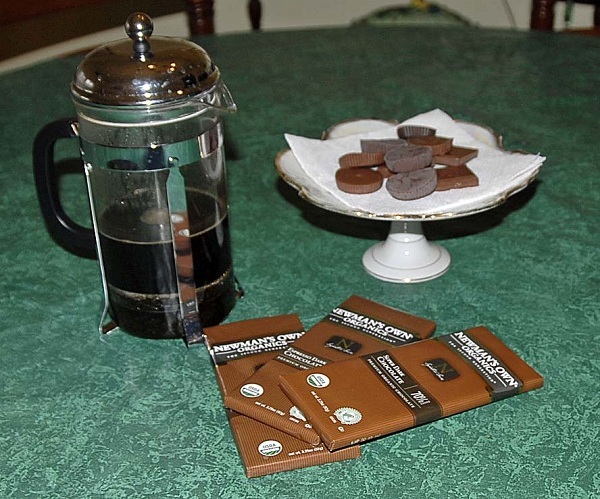 How about adding a premium chocolate to complement your coffee experience. Superior coffee calls for a superior chocolate. I prefer the healthier lineup from Newman's Own Organics. If you consume chocolate daily, like I do, then you want to go with organic. This is because the cocoa crop is highly susceptible to pestilence, growers then need to use a higher level of pesticides. This is why it's better to choose organic chocolate. Newman's Own is my pick for premium chocolate because they meet a high criteria and all the ingredients are organic. You also won't find any junk ingredients in their chocolate, such as high-fructose syrup, which we can all agree is a no-no. Newman's carries a copious selection of various chocolates and cups. Oh, and how they deliver on enjoyment. It's hard to pick a favorite because they're all equally good. Even the peppermint cups, which I normally don't car for, are absolutely amazing. Pick these up at your local health food store or Wholefoods, so you can reach for these when you're enjoying freshly ground coffee from your French Press. I don't always do it (because my grinder is an ancient inefficient thing), but I most like to get those really oily Vienna Roast beans and grin them. The aroma is amazing of both the beans and the coffee itself. I love to grind, can be loud, but the taste and smell of the coffee is so wonderful. I love the aroma of fresh ground coffee.I have been wanting a grinder for awhile now! I love fresh ground coffee because I find when you ground the beans at the time you are ready to make a pot of coffee , your coffee just taste fresher, and I love the aroma it gives off . I usually grind my beans at the store, but I'd love to be able to do it daily at home. And of course the freshness and the aroma. Nothing beats the smell of fresh coffee! I've never used freshly ground coffee at home, but I would love to start. I love the smell of coffee and I have had it before. I think it tastes better. I don't own a grinder yet. I'm learning to like coffee and I can tell there's something better about freshly ground coffee! I absolutely love the aroma of fresh ground coffee,as soon as I smell it I have to have a cup,it's all I can think about! I would really like to try fresh-ground coffee! I used to buy coffee that I ground at the grocery store, but it would take me a few weeks to get through it all (I didn't like buying it more often), and I've read that compromises the freshness. If I could grind it myself on-demand, that would rock! I love freshly ground coffee because it tastes sooo fresh! I've only tried it a few times but would love to start grinding my own! I just automatically buy the kcuos when I go to the store I never think of it till after..I have the reusable kcups to use freshly ground coffee just need to start doing it! I love fresh ground coffee! It always tastes better and I love the smell of the beans grinding. I grind whole beans at the grocery store because I don't have a grinder at home. I would love to grind them at home if I can find a grinder that's easy to use and easy to clean! I like really ground coffee because it adds to the freshness of the beans. Freshly ground beans smell so good. My old coffee grinder died and I really want a new one! I like the freshness of fresh ground coffee. I love the smell of freshly ground coffee even better than brewing coffee. My Mom is the coffee nut in our family. She loves the smell of fresh ground coffee (the supermarket coffee aisle has a grinder!) But we just don't have a functioning grinder right now! I adore freshly ground coffee! It just tastes so much better and I like that I can combine different coffee blends to suit my own tastes. Our grinder is definitely on its last leg, though, and I'd love to have a new one. Isn't it funny how I can almost smell the coffee beans looking at those pictures? There isn't much that smells better than coffee. I love coffee. I currently buy ground coffee but would love to own a grinder and grind it myself. I drink coffee all day long. Actually, I do not drink coffee, but my husband does and he LOVES fresh ground coffee. Says it tastes much better. I love freshly ground coffee. I love the smell of it as well as the fresh taste. It is always a real treat. The rich and earthy flavors and aromas are music to my mouth and nose. Coffee also being a diuretic helps me with digestion which i have trouble with due to a health condition. I love freshly ground ccffee. I love the smell of the beans, the smell off the brew. I like being able to get things just like I like them. Fresh brewed is best! I love freshly ground coffee. The smell is amazing for starters, then there is the taste! mmmm I think I will go make a cup right now. I enjoy the smell of freshly ground coffee the most. I'd love to win this for my mom who is a big coffee drinker. I love the smell of freshly ground coffee, but I can't stand to drink it. I used to work at a coffee shop and I really miss the smell of truly good coffee. My husband is newer to drinking coffee and is ok with already ground coffee. It just feels wrong because I know it's not as fresh as it could be. The aroma of freshly ground beans just seems to make the coffee taste better. I love good coffee and drink it far too much. I would love to grind my own coffee and have fresh coffee every day! I've honestly never had it before, I always buy the already blended kind that is what I'm used to. I'd love to try this! What I love most about it is that rich, delicious aroma of the coffee beans. There's nothing like it. Yes, I would love to be able to grind my own coffee beans at home because it does smell and taste soo muh fresher!! I love fresh ground coffee. I am not sure there is anything better.